Courtesy of Amberwood Real Estate, Inc., Lee Alcafaras. NEWLY REMODELED HOUSE. Everything has been remodeled from flooring to kitchen, bathrooms, bedrooms. Located in a peaceful cul de sac street. It has a living area of 1,719 sq ft on a 5,947 sq. ft. lot area but looks bigger due to open space concept. It has 4 bedrooms and 2 bathrooms with big master bedroom and a master bathroom. The roof has Spanish tile roofing and attached 2 car garage. The property has central a/c and heating. All rooms have laminated wood flooring while ceramic tiles in the kitchen area. Living area has vaulted ceilings, a gas fire place and laminated wood flooring. Laundry area is located inside the garage. 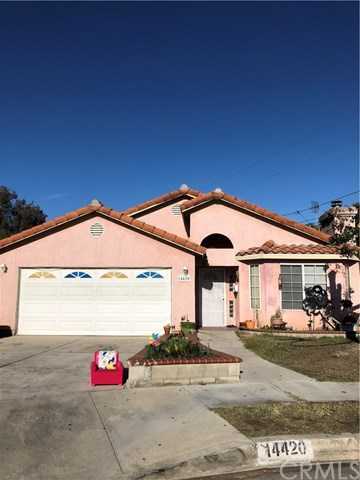 Please, send me more information on this property: MLS# PW18285193 – $620,000 – 14420 Behrens Avenue, Norwalk, CA 90650.